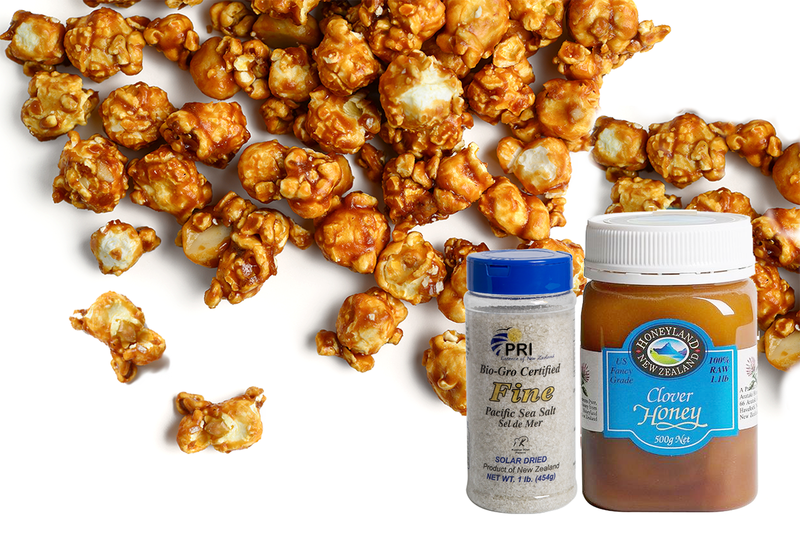 What could be more fun than TV binge-watching with munching on a warm bowl of honey popcorn? So grab your favorite warm blanket, pick a good TV series and enjoy a giant bowl of this wonderful Honey Popcorn! Pop the popcorn and place it in a large bowl. In a medium saucepan, melt the butter, brown sugar, Squeezable Clover Honey, and Pacific Sea Salt. Bring to a gentle simmer and stir for approximately 5 minutes. Remove from the heat and stir in the baking soda and vanilla. Stir until foam goes away. Quickly, pour the caramel sauce over the popcorn. Mix with a wooden spoon. The sauce will begin to thicken as it cools down. Work promptly to make sure the popcorn is evenly coated. Set aside to finish the hardening, then serve and enjoy!